Video shot from the scene showed the frenzied attack that carried on for more than a minute, beginning with the attacker charging at two police officers and slashing at them with a knife. Photo from the scene showed crowds of people behind police barriers. Condition not yet known. The suspect has been shot and is alive, police say. Superintendent David Clayton told reporters at a media conference that police were called to reports of a vehicle fire and were "confronted by a man brandishing a knife and threatening them". 'The exact circumstances are yet to be determined at this stage. The journalist also said an emergency speaker system was warning people to avoid the area. 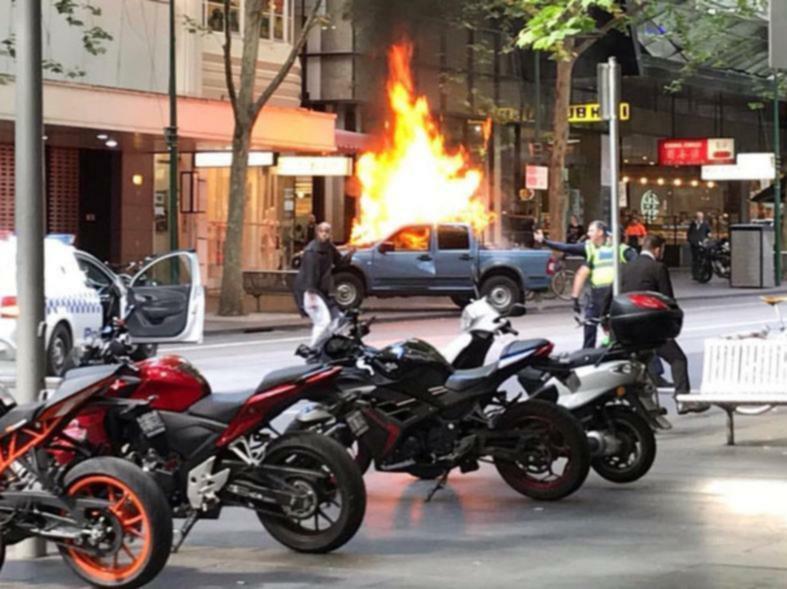 The chaos started when 3AW was flooded with calls from people at the scene who had witnessed a vehicle "bursting into flames" just after 4pm on Friday. Witnesses described a chaotic scene with an injured pedestrian lying on the ground, and numerous police cars and helicopters flying overhead. They said they heard screams and cries from the crowd before they were rushed from the area.